If you thought this was a post on How To Train Your Dragon, you’re (sort of) mistaken. Instead, this post contains a whole lot of spoilers for Season 7, Episode 5 of Game of Thrones. There *was* a Harry Potter marathon on Freeform on Sunday so you could be forgiven if, for a quick second, you thought you were watching Harry Potter greet Buckbeak the Hippogriff during The Prisoner of Azkaban. You could even be forgiven if you thought you were watching a live-action version of Dreamwork’s 2010 CGI family-friendly film, But no, we’re watching Game of Thrones and for the first time EVER, Drogon approached a human being *other* than Dany and didn’t immediately scorch them. Talk about the ultimate, “Jon is a Targaryen,” confirmation. 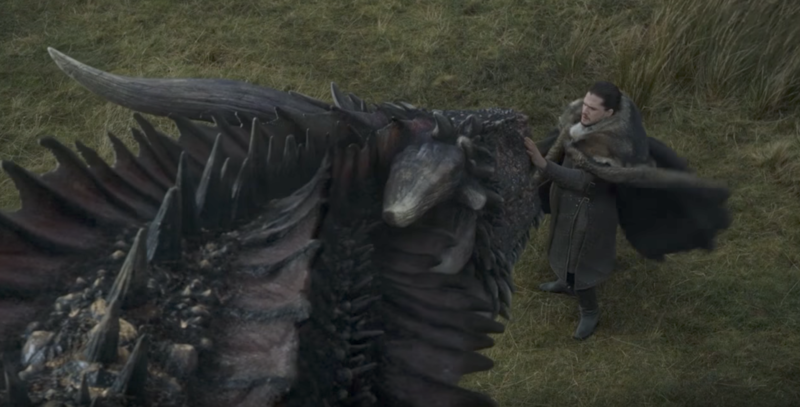 Jon’s watching Dany and Drogon fly back to Dragonstone after killing a bunch of people, when suddenly Drogon pops a squat *right* next to Jon. The King in the North is clearly terrified because, you know, he’s staring into the face of a dragon, and dragons breathe fire. But, since he most certainly has a crush on Dany (his aunt, but this isn’t the time to get into this), he’s trying to play it casual. Meanwhile, Dany is fairly concerned about the Drogon/Jon situation up front because Drogon *is* the most savage of Dany’s children. Drogon and Jon are inching towards each other, and 10 million people, plus Dany, waited with baited breath to see if Drogon would torch Jon like the Tarlys just seconds ago. *Okay, so we knew Jon wouldn’t actually die but in theory he could have. Jon’s nervous AF while Drogon is *clearly* just saying hey to his cousin. The whole scene is incredibly moving. Jon looks really emotional, Dany is watching everything unfold in total awe, and the music is beautiful. If this was a romantic drama and not Game of Thrones, it would have been the moment Jon and Dany fell in love. Regardless, especially knowing everything about Jon being a Targaryen, it’s a spectacular scene to watch. But soon the Targaryen moment ends, as Dany dismounts to chat with Jon and we’re reminded that the dragons are her children and Jon thinks this is hella weird, but is from the North and is polite. “Eastwatch” was an incredible episode for so many reasons but this scene between Dany, Jon, and Drogon is the literal definition of the beauty and weirdness that is Game of Thrones. Dany and Jon parted ways last night, but they better reunite soon because Dany needs to teach Jon how to train his dragon!